Baby Crochet Pattern. Play and be creative. In order to make baby crochet pattern you have to remember your childhood. Just play and be creative. You will be amazed by the results. When crochet for baby or kid, don't forget to smile. You might are not that experienced crocheter, but crocheting is a very forgiven and flexible technique. Relax and don't be afraid to be creative. 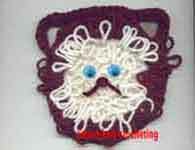 On this page I started a small collection of crochet patterns for kids. They are very easy to crochet. To make each baby pattern listed in the table, I used either basics crochet stitches and techniques or the cutout fabric motifs. You will find more baby patterns added as I build this site. I suggest you a couple options for using these baby crochet patterns. They can be used as applique motifs. 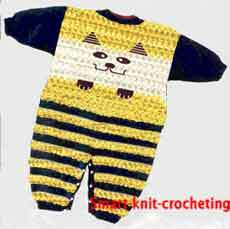 Make a pattern "as is" and decorate any element of the existing baby garment: front side of a sweater, pocket, sleeve, and etc. A complete description of these design can be found at Baby Coverall page. Here are some possible small projects. Make a basic flat circle 8 - 10 cm in diameter. Use single or double crochet to make a basic flat circle. Each ear is 7-stitch wide at its base. Every next row is 2 stitches shorter. 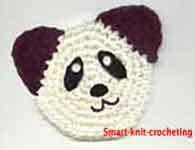 Crochet each ear around to make a smooth edge. Embroidery the face to complete the work.